Road viewpoints, obtained from Kent's public roads, were chosen to correspond with the intersections of these road segments with other roads, the town boundary, subbasin boundaries (an indicator of high points along the road), and known vistas. The viewpoints were converted to a three-dimensional file. The elevation was derived from the TIN model, and a target offset value of 35 feet was assigned as an attribute for each viewpoint. The target offset value of 35 feet corresponded to Kent's current zoning regulations. Viewshed analysis used the TIN model to calculate areas of the landscape where a 35-foot structure would be visible from at least one of the selected viewpoints and generate a grid. This grid was reclassified. Cells visible to any viewpoint were assigned a value of 1 and cells not visible to any viewpoint had a value of zero (0). Using ridgeline data, the portions of road viewshed that corresponded to the ridges were identified. A ridge viewpoint file was created that corresponded to the back edge of the viewshed traversing a ridge. The ridgeline was used only as a horizontal guide for the location of the ridge. The back edge of the viewshed and the corresponding ridge viewpoints could extend beyond or fall short of the actual ridgeline. At least three ridge viewpoints were selectedtwo from near the ends of the ridge and one from a high point along the ridge. Additional viewpoints were added for divides as indicated by ridgelines and were also added at viewshed junctions where the back edge of the viewshed changed direction sharply. Viewshed junctions represent locations viewed by more than one road viewpoint. The ridge viewpoints were converted to a three-dimensional file with elevations derived from the TIN model. Both target offsets and observer offsets of 35 feet were assigned as attributes to all viewpoints. Analysis masks were used to constrain the viewshed analysis from the ridge viewpoints to a limited area. Areas behind ridge viewpoints were of no concern and were excluded by the masks. Analysis masks also were used to segment concave ridges and create separate horizon belts for each ridge segment. Without this segmentation, a false horizon belt could be created by the viewshed from an opposing ridge's viewpoints. Ridge viewpoints are located at the back edge of a belt where a 35-foot structure rises above the sight line from the original road viewpoints. Giving these ridge viewpoints an observer offset of 35 feet locates the viewpoint at the height of this original sight line, rather than at ground level. The ridge viewshed analysis used the TIN model and the 35-foot target offset to calculate the areas of the landscape where a 35-foot structure rises above the original sight line. Beyond this viewshed edge, a 35-foot structure would be out of view from the ridge viewpoints with only land as a backdrop. The ridge viewshed analysis subtracted areas from the road viewshed analysis that have a backdrop of land rather than sky. The output of the ridge viewshed analysis was reclassified. Cells visible to any ridge viewpoint had a value of 1, and cells not visible to any ridge viewpoint had a value of 0. The horizon belt is the intersection of the road viewshed and ridge viewshed grids. Areas common to both grids receive a calculated value of one, while areas in just one grid receive a calculated value of zero. These belts delineate the area where at least some portion of the backdrop to a 35-foot structure would be open sky, as viewed from the public roads. Horizon belts are a subset of a viewshed, the area within a viewshed where structures have a backdrop of sky rather than land. Further constraints were added to this subset. 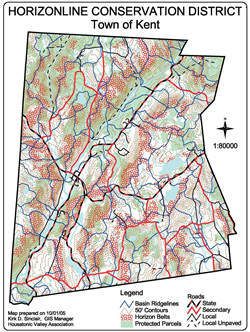 A 1,000-foot buffer created from the ridgelines was given a grid value of 1. A slope gradient map, generated from the DEMs, was reclassified to indicate slope gradients greater than or equal to 15 percent with a grid value of 1 or slope gradients of less than 15 percent with a grid value of zero. A dataset of steep slopes or ridgeline buffer was combined. A subset of all horizon belts was derived from an intersection with this grid of constraints. 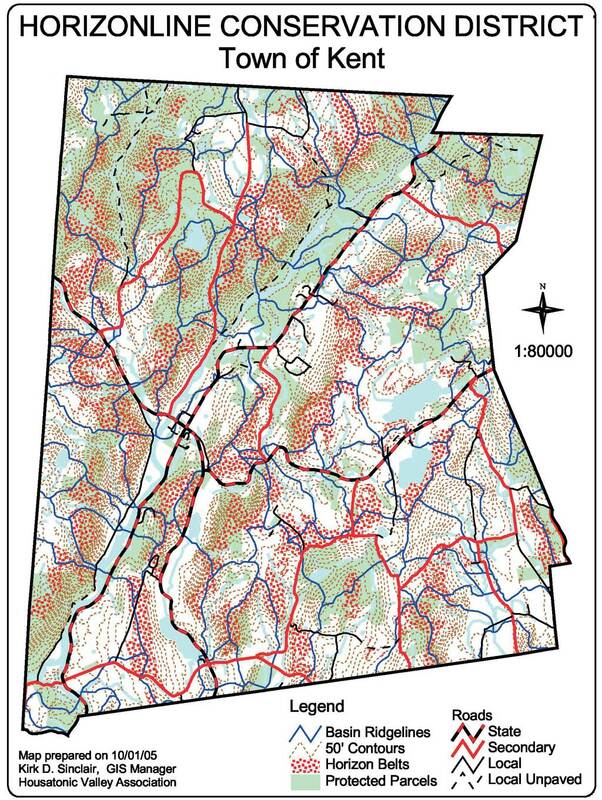 Recreational groups or watershed organizations may have different criteria for vistas, such as trails or rivers, and using multiple vistas from different observation distances or elevations will require multiple analyses. For example, the part of a ridge that becomes the horizon line for an adjacent road below the ridge differs from the horizon line viewed from vistas on another ridge. Thus, the corresponding horizon belts would need to be determined separately. Instead of more restrictive datasets, such as designated scenic roads or landmarks, Kent used all public roads as the criteria for vistas. All distinguishable ridges within the town were considered. Using what breaks the horizon as the criterion for obtrusiveness depends on the height of the structure that would obtrude from within a horizon belt. Zoning regulations impose a height limit of 35 feet for houses, and this became the empirical basis for obtrusiveness. Regulations determining structures allowed and height limits will vary by town. The commission arrived at a consensus regarding the criterion used for constraining horizon belts around ridgelines. The constraint for steep slope gradients was based on preexisting town regulations for building roads. Other constraints might be based on soil type definitions or slope gradient requirements for other built structures. A constraint could also be used to ensure that horizon belts occur a specified distance away from roads. In August 2005, the Horizonline Conservation District was officially approved. Other Appalachian Trail towns in Connecticut have been waiting to assess the effectiveness of this new approach before following suit. Some towns outside the Appalachian Trail corridor are implementing or considering this methodology as well. Western states have some of the highest growth rates in the nation. The horizon belt methodology could prove beneficial for anywhere that scenic ridges and development patterns seem destined to collide. Developing scenic ridges threatens more than local town character. Trails and watercourses that come in close proximity to private lands, as is the case along the Appalachian Trail, can be negatively impacted by intrusive development. Kirk D. Sinclair received a doctorate in natural resources from Cornell University in New York. As the GIS manager for HVA since 1997, he has applied GIS to water quality monitoring and stream surveys throughout the Housatonic River watershed and worked with rural towns applying GIS to solve geographic problems.